Patients with a valid Medicare card will be bulk billed for their pre-booked consultation Monday – Friday. We accept both booked appointments and walk-ins patients, however there will be a fee for patients without an appointment. Wait times for walk-in patients may vary as appointments are prioritised. 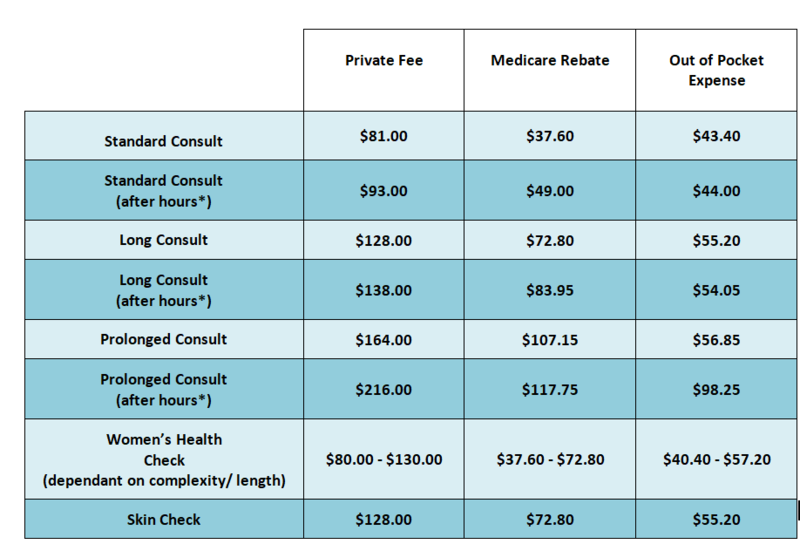 All consults are billed based on duration and complexity. Private billing occurs for all patients without Medicare, patients without an appointments (walk-ins), all appointments on weekends and Public Holidays and for certain procedures (i.e. Skin Checks, Womens Health Checks). An after hours consult is any consultation after 1pm on Saturdays, all day Sundays and all day Public Holidays. Please note that our fees have slightly increased from 14/01/2019. Please note that a Non-Attendance Fee of $20 is payable if a patient does not attend their standard appointment or if the appointment is cancelled with less than two hours notice. There is a fee of $40 for long appointments not attended or cancelled within two hours. Any consultations requiring additional services may be charged a procedural equipment fee of between $10 – $80. Pre-employment medical assessments and other medical assessments are also privately billed.